Lima beans are most often associated with succotash, a traditional Native American dish that combines this delicious bean with corn, many people think that they are native to the United States. 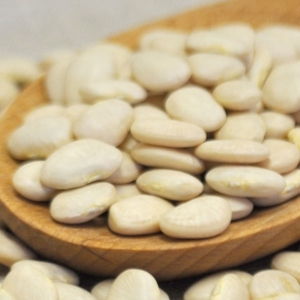 Our wholesale lima beans come from Canada and take well to being grown in the cold climate. While there are many varieties of lima beans, the ones that we are selling here are the most popular in the U.S., commonly known as the Butter Bean. The pod of the lima bean is flat, oblong and slightly curved, averaging about three inches in length. Within the pod reside two to four flat kidney-shaped seeds that are what we generally refer to as lima beans. The seeds are generally cream or green in color, although certain varieties feature colors such as white, red, purple, brown or black. Lima beans feature a starchy, potato-like taste and a grainy, yet slightly buttery, texture. Among all groups of food commonly eaten worldwide, no group has a more health-supportive mix of protein-plus-fiber than legumes. Included here, of course, is the amazing protein-plus-fiber content of dried beans. From a single, one-cup serving of dried beans you get nearly 15 grams of fiber (well over half of the Daily Value and the same amount consumed by the average U.S. adult in one entire day of eating) and 15 grams of protein (nearly one third of the Daily Value and equivalent to the amount in 2 ounces of a meat like chicken or a fish like salmon). You won't find this outstanding protein-fiber combination in fruit, vegetables, grains, meats, dairy products, nuts and seeds, or seafood. Before washing your beans, spread them out on a light colored plate or cooking surface to check for, and remove, small stones, debris or damaged beans. After this process, place the beans in a strainer, rinsing them thoroughly under cool running water. To cook beans on your stove-top, combine soaked or dried beans, water, oil or fat, and seasonings in a saucepan or pot of appropriate size. Bring these wholesale lima beans to a boil, reduce the heat, then cover and simmer until beans are tender. This takes 1 to 3 hours, depending on the bean variety. Check the beans occasionally to see if they are covered with the cooking liquid. If there is so much liquid absorption and evaporation that the top of the beans becomes exposed, add very hot tap water to the pot to cover the beans.